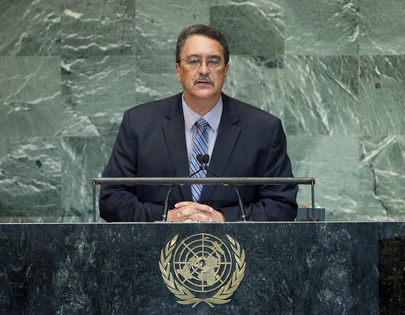 KENNY DAVIS ANTHONY, Prime Minister of Saint Lucia, said that each year as speeches were delivered in the Assembly Hall, it was easy to forget that behind each country’s representative were real people seeking cherished moments, despite their troubles and despair. As such, all nations should embrace solidarity and commonality and ensure that “our faiths should never tear us apart”, but should form bonds of understanding and tolerance. At the same time, he said, no one expected a naive world, or a world completely without tension and disagreement. “However, I ask that we have the courage to be bold about the world we want; that we act when we know we can,” he said, adding that political leaders must always remember minorities, those that were forgotten, marginalized or “easily wiped away”. Touching on a number of peace and security issues, he said he looked forward to a peaceful resolution to the crisis in Syria and an immediate end to the “carnage” there. He said that Saint Lucia was committed to the achievement of peace throughout the Middle East region, and urged all stakeholders to understand that ongoing turbulence there was not only unacceptable, it impacted oil prices, hampering the interests and development prospects of countries both large and small. He also looked forward to continued evolution in the peaceful rapprochement between China and Taiwan “as they search to unify their civilization”. Turning next to Africa, he expressed support for permanent representation on the Security Council for nations from that continent, as “the voices of 1 billion people […] should no longer go unheard”. Continuing, he welcomed resolution to the longstanding dispute in Sudan and the achievement of self-determination of South Sudan. He said that while bolstering democracy and good governance were crucial for development, it was also important to acknowledge past injustices, including slavery, forced labour and the decimation of cultures and identities. “Many of us today are descendents of the survivors of slavery,” he said, recalling his Government’s support of the move by Caribbean nations to raise awareness about the impacts of the transatlantic slave trade, and the need for dialogue on the status of peoples of African descent. Also on situations in his region, he denounced the embargo on Cuba, calling those measures an anachronistic “relic from an era of fear” that had been imposed purely for political retribution. Blockades and embargoes were outmoded, and in an era of globalization and economic liberalization, could not be tolerated or justified. Haiti was another nation suffering from the relics of colonial attitudes, he continued, noting that what had been the first black independent nation in the Western hemisphere was now the region’s poorest country. Haiti still needed and deserved the support of the United Nations, especially as it was still recovering from the devastating 2010 earthquake. He went on to urge broader awareness about the impact of illegal narcotics and guns in his region. The Caribbean could never have peace as long as its young people had easy access to guns, he said, and added that the recent Cartagena Summit of the Americas had focused on that issue and had also heard delegations acknowledge that measures to combat cross-border drug trafficking had failed. The region’s States were determined to undertake a comprehensive review of the situation, and knew that they must craft new solutions. He went on to note that many small States were deceptively categorized as “middle-income” merely on the basis of their per capita income. Yet, countries like Saint Lucia, which faced unique vulnerabilities, should not be subjected to such a measuring tool. Indeed, Saint Lucia had experienced one hurricane in 2010 that had caused damage that wiped out 30 per cent of its gross domestic product (GDP). That was just one category 2 hurricane in one year, he said, explaining that following such extreme weather events, small islands and States were forced to borrow to replace damaged roads and repair infrastructure. In some countries, that situation was compounded by the impact of unilateral measures put in place by major economies and the prevailing inequitable trade environment. With all that in mind, he said the collapse of the Doha Round of World Trade Organization (WTO) negotiations had been a “disappointing portent of difficult times to come”. He looked forward to a time when United Nations and other institutions worked towards more targeted and differentiated policies.